When my mum moved to be closer to her daughters, she had a big clear-out and I became the owner of some old pieces of kitchen equipment that she no longer wanted. 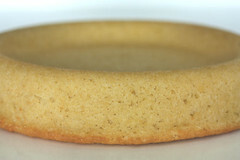 One item was a round flan tin for baking sponge cakes, with an indent in the middle for the filling. I had good intentions of using it but ended up shoving it into the back of a deep cupboard. The other day I fished out that tin and used it for the first time. I buttered and floured the tin and crossed my fingers (and toes) that the mixture wouldn't stick, it's not the kind of tin that you can line with your best friend, non-stick baking parchment. The cake looked good when it came out of the oven, although it didn't pop out when I turned it over. Leaving it to cool in the pan, I tried again and with a bang on the kitchen work surface it gracefully plopped out in ONE WHOLE, beautiful piece. YAY! Thank you sponge cake tin, and thank you mum! The tin will NOT be going back into the cupboard of doomed kitchenware, it's been fast tracked to the drawer next to the oven, where it will be lovingly and frequently used. Preheat the oven to 180ºC/350ºF. Grease and flour a 20cm/8" flan tin. In a large bowl, cream the butter and sugar together until light and fluffy - I use an electric hand whisk. Beat in the eggs, one at a time, adding a little flour with each egg. Beat in the vanilla extract. Fold in the rest of the flour with a large spoon. Spoon into prepared tin and bake for 20-30 minutes until springy to the touch and a cake tester comes out clean. Remove from tins and cool on a wire rack. Lemon curd to your taste, I used about 1 cup - you can use store bought or make your own, I use Delia Smith's recipe. Whip the double cream to soft peaks and fold in the lemon curd. To assemble: spread the lemon cream onto the sponge base and pile the fruit on top. 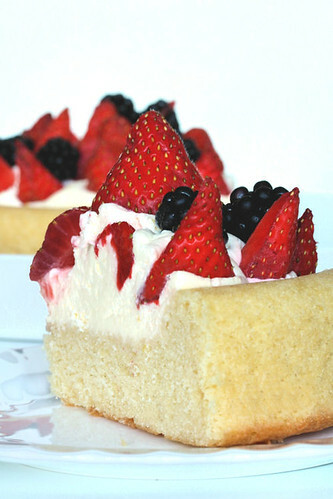 Note: next time I make this, I am going to brush the sponge with a strawberry/raspberry syrup mixture. A lovely cake indeed. I love all the berries on top! This looks wonderful I wish I had a pan like this. Oh the possibilities! Wow, this is very beautiful. I bet it must be super berrilicious! how cool! that pan's a terrific find, and what a yummy way to use it! i think brushing the cake with your syrup is a great idea. brilliant dessert, nic! You did a much better job of presenting your cake than I did, when I made this cake. The strawberries on top were thrown on a bit slapdash, as my dad was hanging over my shoulder. It is yummy isn't it? That is a very interesting pan, Nic! And I love how beautifully used it was. Love the Shape of the cake. I will have to try to find a pan like that! Wow, that looks amazing! I love different shaped cake tins but always worry that the cake won't come out - your sense of relief is palpable!!! 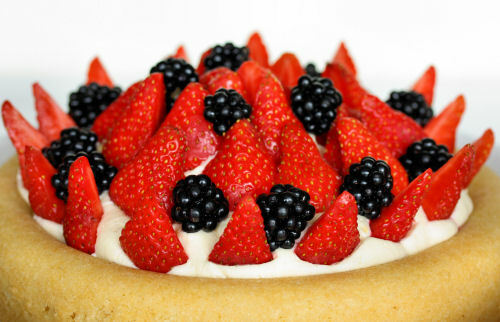 The lemon cream filling sounds like an excellent complement to the berries and cake. That looks delish Nic! I haven't made a sponge flan for years....I might just have to rummage in the cupboard and see if I've still got my flan tin! The cake looks brilliant, and very summery! Beautiful recipe and so fabulous for the summer - exellent! I love this cake! I love the cake tin. Off to Amazon to see if I can get me one. WOW...beautiful cake & lovely sharp pics Nic. Am GLAD to see ya baking again! You must ♥ Mum for this lovely tin. I'm gonna go pester my Mom...he he! You must have done a jig oy joy when it popped out cold. Brilliant! BTW don't you just love using vanilla sugar? I do now for most of my baking, & the kids have begun picking out the flavour! Looks like the tin has been put to excellent use!! You definitely don't see these tins any more! I had mouth water just to see this cake! Vintage pans passed down by our Moms are always lovely family keepsakes. Glad you finally used it to make this beautiful cake. I must try yr sponge cake recipe as the one I have doesn't taste so nice. Not sure why. Nic, I'm so glad your mom's cake tin finally found a loving home, with a talented baker. Your lovely Strawberry and Lemon Cream Cake is a perfect fit for that tin. Delicious looking cake and the perfect shaped tin. Its always nice to get new bakeware, handed down. Wow, that looks amazing. Yum! And what a neat pan! Lovely presentation. I have single-serving sponge tins like this, but haven't baked with them yet. Your success is inspiring. What a georgous looking cake: just pure deliciousness! That is a beautiful cake, so fresh and inviting. I would love a piece with my afternoon cup of tea! oooh...I want a pan like that! everytime I make cake with fruit on top, the whipped cream tends to melt...and the fruit slides off! Jacqueline - I had forgotten that you had made a similar cake, that one had me drooling! That's gorgeous! A sponge cake tin??? I've never heard of such a thing. Must investigate! Very pretty, and fresh looking cake. Simply perfect for summer. That third picture is to die for, mmm. Great way to use your tin; I love the idea of folding lemon curd into cream for a really easy lemon cream. I bet this would be nice with a bit of lemon zest and maybe some ground almonds in the sponge, too. 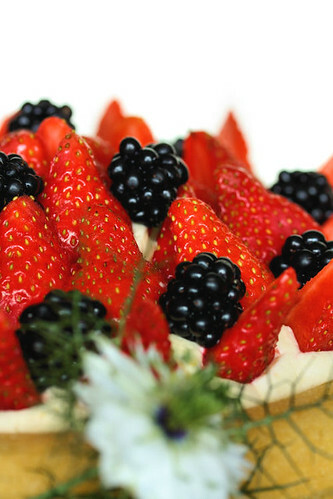 I love fruit cakes, fruit tarts, fruit desserts...and this one looks so fresh and beautiful! Mouthwatering and like always lovely phototgraphy! Oh, what a gorgeous flan! Inherited kitchenware is the best - I inherited a proper cookie press from my mom and hope to fire it up over Christmas!